Stephanie Anne Johnson is an Associate Professor in the Visual and Public Art Department of California State University, Monterey Bay. Ms. Johnson is also a visual artist and second-generation theater worker specializing in lighting design and Black theater history. Her undergraduate and graduate degrees are in Theater (B.F.A. – Emerson College, Boston), Interdisciplinary Studies (M.A. – San Francisco State University), and Art (M.F.A. – the University of California, Berkeley). 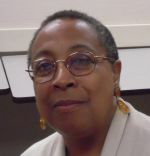 Her article, “Women, Shared Leadership, and Policy: The Mano River Peace Network Case Study,” appeared in the Journal of Pan African Studies 4:8 (2011) and her essay on teaching public art was published in The Practice of Public Art (2008). Currently a candidate at Union Institute & University (Cincinnati) for a PhD in public policy, she is completing her dissertation on the Harlem Renaissance and the New Deal. Professor Johnson is also a Fellow at The Wildflowers Institute in San Francisco.